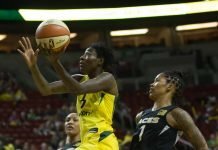 As just about every WNBA team romped through a winning streak, struggled through a losing streak – or both – this year, team chemistry was called into question. And arguably, many of the teams with the best brand of that formula will be suited up for the playoffs later this week. Team chemistry is a complex concept at best, unexplainable at worst, but increasingly definable. As they contemplated their post-season, which begins tomorrow, a group of league coaches and veteran players helped put the pieces of team chemistry together. Traditionally, team chemistry has been thought to be the degree to which teammates like one another. But coaches and athletes said this is a mischaracterization. True team chemistry is a blend of structure, accountability, common goals, respect, trust, familiarity and growth. And it is the responsibility of both players and coaches. Silver Stars Coach Dan Hughes said that like any job, chemistry begins with personnel and job assignment. Unity takes shape when athletes put the aims of the team before themselves. Storm center Lauren Jackson, a two-time WNBA champion, has a similar viewpoint. Sun Coach Mike Thibault’s philosophy stems from roles. Two years ago Connecticut drafted Tina Charles as part of building a new team. They did not qualify for the playoffs that year, but took the Eastern Conference title this season. Thibault said the process was a matter of giving players direction, and then letting them find their way. Part of that lesson was learning to embrace their roles. 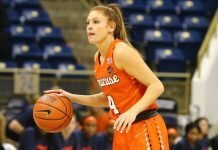 Thibault said when he made guard Renee Montgomery a bench player this year, everyone had to accept that it was best for the team. “Now I’m harder on them and more demanding as they’ve been able to handle it,” he said. McWilliams-Franklin, who has helped win two championships, said common goals and sacrifice equates to equal accountability. Thibault said that also means an equally-shared work load. “You never reach total team chemistry until your best players are your hardest workers and your strongest leaders,” he said. Jackson said friendship between teammates is nice, but it’s not necessarily a pre-cursor to team success. Team chemistry is solely a group on-court relationship. “Off the court you may be great friends as teammates, but it’s hard to find that line on the court,” Jackson said. Los Angeles Sparks Coach Carol Ross agreed that mutual respect between players is a must – even when they don’t get along or agree. That, she said, is the very root of team chemistry. Hughes agreed that respect is essential to a successful team, and said it starts with the head coach. Once the foundation has been established, athletes say it’s a matter of getting to know each other’s playing styles and building trust on the court. The longer teammates have been together, the better. Liberty forward DeMya Walker, who helped the Sacramento Monarchs win a championship in 2005, said it’s impossible to have good team chemistry right away, when athletes don’t know one another. But the more athletes are around each other and play together, the better it gets. “It’s that moment when you all feel the same way: ‘we’re in this together,'” she said. Sutton-Brown points to the 2009 season, which culminated in the Fever playing for a championsip, as an example of perfectly-cooked team chemistry. It was one year where all athletes were back from overseas committments on the first day of training camp, and they developed connections early. Walker concurred that it’s easy to upset the apple cart. “Every time you change a couple of pieces (players), it throws the chemistry off,” she said. Though getting along outside of basketball is a plus, coaches and athletes said the best way to develop team chemistry is by playing together – a lot. Walker said there’s one way to know if your team has the necessary chemistry. Differences between women and men? Studies – including one by this writer a decade ago – have shown that female athletes tend to be more concerned with the moods and feelings of their teammates and coaches than male athletes. So does this mean team chemistry is different for women? Maybe. Thibault said sometimes the women he has coached don’t want there to be conflict on the team, even though it’s inevitable. “It’s healthy sometimes, and I tell them it’s OK to have conflict, but don’t take it personally,” Thibault said. Jackson believes team chemistry is more important for women because they rely less on athleticism at times, and more on technical skills. “When you have to do all the little things, you need a sense of solidarity,” she said. In their storied careers, which each span over a decade, McWilliams-Franklin, Jackson, Walker and Sutton-Brown have all had experience with team chemistry and non-team chemistry. McWilliams-Franklin called it, “the trajectory of chemistry,” and said sometimes, poor team chemistry can’t be fixed. “If you can’t get it together, it’s really frustrating,” Jackson said. 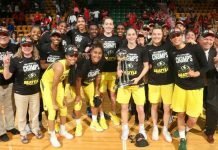 This year finds each on a team that has found enough unity to get to the post-season – particularly the Fever, who have been even stronger since resuming after the Olympic break. Tomorrow round one begins with the Liberty at Connecticut and the Silver Stars at Los Angeles. Friday it’s the Dream at Indiana and the Storm at Minnesota. Though it’s only been since the weekend that the regular season has been over for most teams, there is an urgency to get started with the playoffs. “We’re ready to play,” Hughes said.